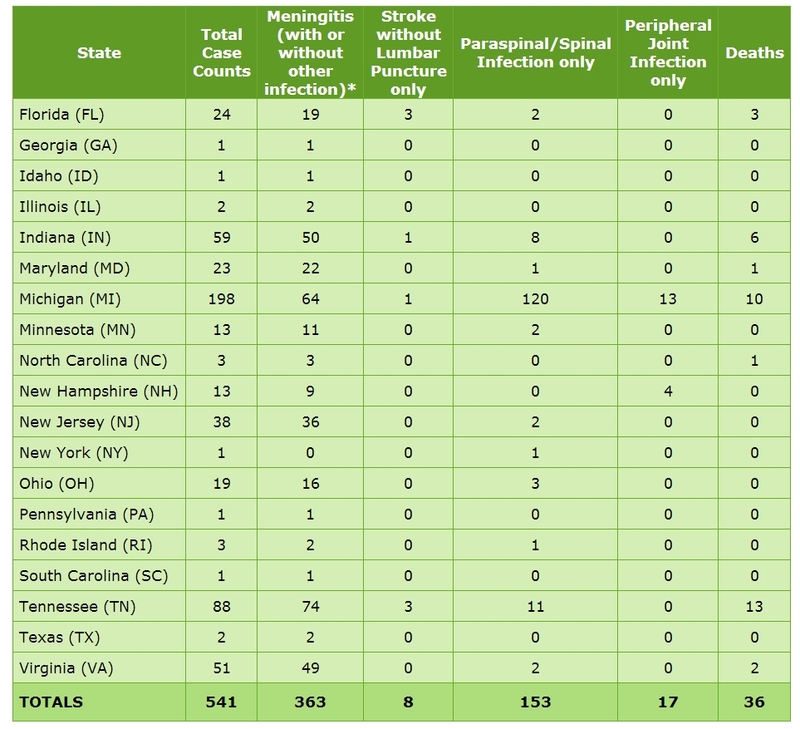 fungal meningitis cases and related deaths as of 12/3/12. Watching the meningitis outbreak unfold has been watching a tragedy in the making. As of this writing, 541 people in the United States have developed the disease, and 36 of them have died. The source of the outbreak was fungus-contaminated injections of an immunosuppressant steroid from a compounding pharmacy. The compound used in the injections was preservative free, which appears to have allowed the contamination to occur. The unfolding story has led to closer scrutiny of compounding pharmacies and their practices, but that comes too late for the outbreak victims. Meningitis is an inflammation of the meninges, the membranes encompassing the brain and spinal cord. Bacterial meningitis is highly infectious, but this fungal form arises from the spinal injections with the contaminated steroid preparation rather than person-to-person infection. To add to the anxiety for people who received spinal steroid injections in recent months, the infection can take weeks to manifest. And while death is obviously the worst outcome, as Superbug author Maryn McKenna discovered in her insider's eye-view look at how the outbreak unfolded, people who survive this meningitis still have a long, unpredictable, costly, and painful recovery ahead of them. McKenna storified a briefing from the Center for Disease Control and Prevention's Dr. John Jernigan, who directs the CDC's Office of Health Associated Infections Prevention Research and Evaluation. He's the person who's been overseeing the meningitis investigation, which involves tracking not only the source of the outbreak but where it started, where new cases are arising, and the clinical outcome of each case. But what struck me, in Jernigan’s description of this outbreak, is that this story will continue long after most of the reporters covering it have moved on to other issues. These patients, it turns out, are facing unusually lengthy, high-dose, toxic and expensive treatment, with uncertain odds of success. Months after the injections were delivered, he said, it isn’t possible to say that any of these patents are cured; in fact, at this point, no one can say just how “cure” will be defined. For more about what McKenna learned regarding what the meningitis survivors face, read the complete storify here.